The miner would bring the ore to the mill and load it into the ore car. The heavy ore car would be brought up to the mill on a tram-track by the aid of a winch. 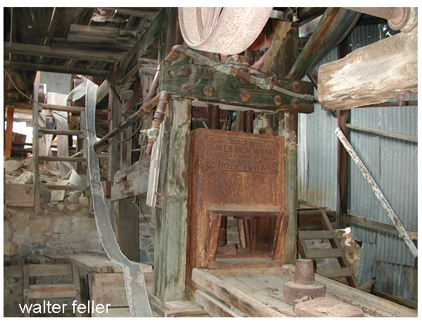 Once the ore was at the top of the mill, the car would be emptied on to a screen called a 'grizzly.' The 'grizzly' was a metal grate with separators about 2 inches apart (about the distance of the claws on the paw of a grizzly bear). 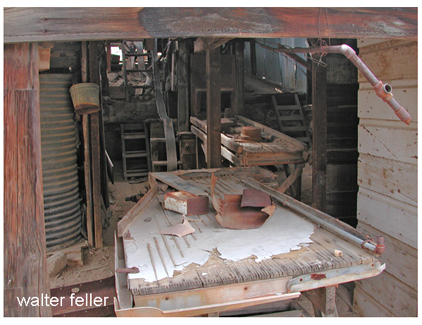 Smaller material would fall through the screen and into the ore chute while larger material would slide across the 'grizzly' into the crusher. 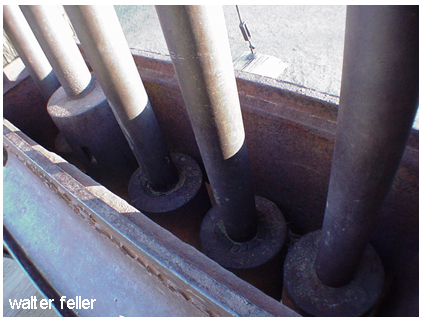 The larger pieces of ore passing into the crusher would remain until they were pounded into a workable size (less than 2 inches) then fall into the ore chute. 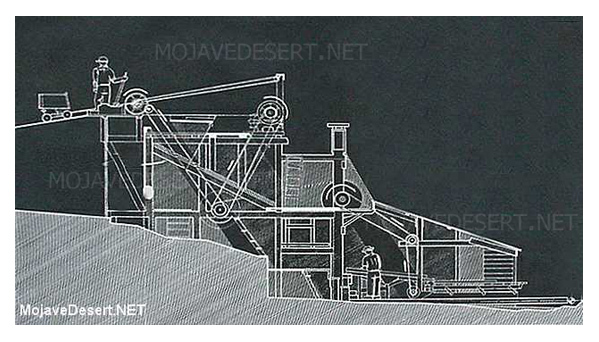 The ore, now about the size of a course gravel would, slide on to the heavy metal plates under the stamp battery where water would be poured on. 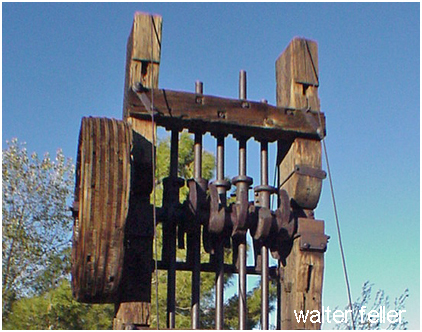 The battery usually consisted of sets of 5 stamps (5 stamp, 10 stamp, 20 stamp mills, etc). The stamps would be lifted in sequence by a powered cam and then dropped using gravity to to pulverize the ore into a fine, sandy slurry. The slurry would be spread evenly over the recovery table. 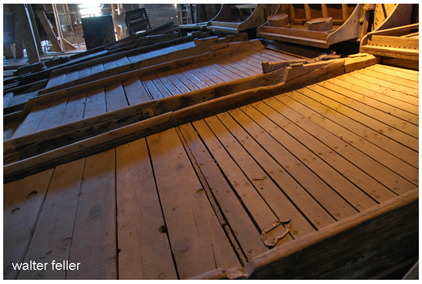 The recovery table was a copper-sheeted table that was coated with mercury previous to the processing run. The gold in the sand would adhere to the mercury while the sand would pass over to the next step in the process, the concentration table. The concentration table was a table with runners which would shake or vibrate, slowing the heavier material containing the gold to a stop while letting the worthless tailings pass to a conveyor to be transported away. 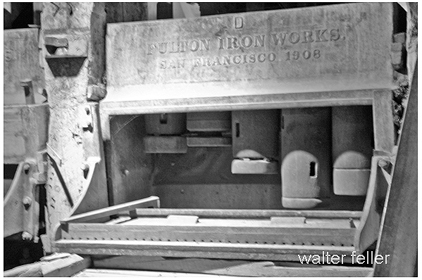 The crushed sand from the table would be loaded back into the stamp mill, pulverized further and once again slurried across the mercury coated recovery table. Once the mercury on the recovery table was full, or the ore run was complete, the gold and mercury would be scrapped off the table and separated. Separation would be accomplished by straining the amalgam mixture through a chamois. Further separation could be done by a retort process. The retort would heat the mercury removing it from the gold as vapor and condensing it for later use. The remaining gold was now in amalgam form, ready for further refinement processes such as smelting into bullion.